Chinese Checkers is one of those fun games from childhood that most people enjoy playing and then seem to abandon as they get older. It was originally based on a game named 'Hoppity' that is British in origin, not Chinese as its common name may have you believe. It's also not checkers either, but during the 1920's Oriental style was in fashion and the game was given the title that it's still known as in the UK. In Europe the game is called Halma and rules differ slightly, but regardless of rules or where you play, it's still one of the most fun games around. Chinese Checkers is usually played with between two and six individuals. 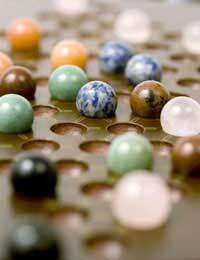 Each player is given ten marbles that are placed on the board. The board is a star and has coloured points on it and the marbles are placed based on those colours. Each player is aiming to be the first to get all of their marbles across the board into another player's point. Although it sounds simple and the actual playing of the game is very straightforward, winning at Chinese Checkers can be tough. One of the easiest ways to play to win is to use a method known as the 'hop-across' method. This involves a single marble being placed into one adjacent space or simply jumping your own or your opponent's marbles to move across the board. It's really a game of skill and thoughtful planning and anyone who plays should always try to think one step in front or more if possible! To start playing a game of Chinese Checkers, one player must move one of their marbles a single space outside of their coloured star point. The next player will then move and from here it's a game of strategy. The trick is to find spots where you can jump your own and your opponent's marbles without losing them. A great tip is to get all of your marbles out of your star point triangle as soon as possible - this is a game of proactive strategy! If all of your marble are out of your own area, it gives you more options for which jumps to make. If you become highly skilled at the game, you may be able to make jumps all the way across the board in one move. Some players can plan these moves in advance and before you realise what has happened, they've jumped a series of your marble and made it all the way to your point. Many beginner players will spend so much time focusing on the current move that more experienced players will easily beat them. If you end up with lots of your marbles in the centre of the board, this shows your inexperience, but practice makes perfect. Many players will set up games to play themselves, simply to gain experience and learn the best strategic moves to make the best jumps. Playing against yourself lets you think like the other players and hones the skills of thinking a few steps in advance. One of the best aspects of Chinese Checkers is that it's relatively inexpensive to buy the board and you can also buy a variety of travel versions to play on the move. It's also a great game to teach kids as it's very easy to learn. It will help them develop strategy thinking and planning and as it doesn't involve any counting, it's accessible to all age groups. Many older people will continue playing the game that they themselves learned during childhood and it's a great game to encourage a group of people to have fun together. Always remember that no matter what age you are, Chinese Checkers is about strategy and planning ahead. If you follow these helpful tips, you'll be a Chinese Checkers master in no time!